Thinking of signing up for this class? I wrote this post for you. 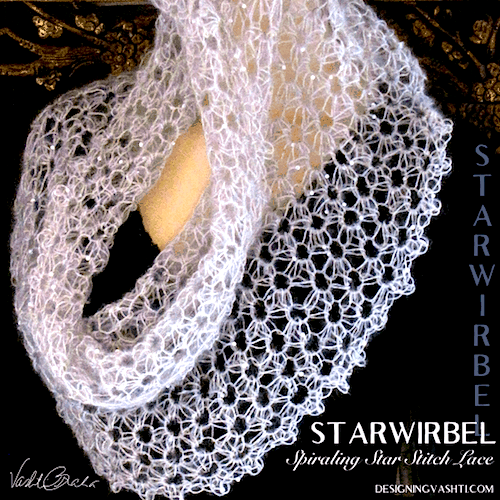 Looking for more of Vashti’s star stitch designs? See all of her self published star stitch designs here. See all of her unpublished star stitch projects here (log in to Ravelry first to see all of them). These are self-updating links. Issue #70 Starting a Stitch with a Backtrack! The Original 2014 Star Stitch Class Resources page. My Star Stitches Flickr album since 2013. Note that newer images display last (chronologically), the default in Flickr. Almost 600 images so far. Any Books on Star Stitch Crochet? Next post: Why “Self-Healing” Crochet Stitches?